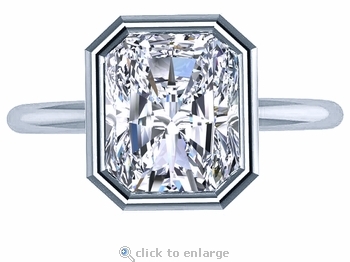 Our Bezellia 2.5 Carat Emerald Radiant Cut Cubic Zirconia Bezel Set Solitaire Engagement Ring features a 9x7mm stunning radiant emerald cut center with 104 sparkling facets that are hand cut and hand polished to exact diamond specifications. 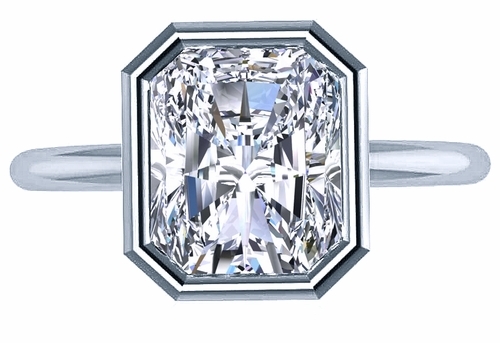 An elegant and streamlined bezel setting perfectly accents the 2.5 carat emerald cut for an engagement ring that can be paired with a complimentary matching wedding band. Choose from 14k white gold or 14k yellow gold. Whole and half finger sizes are available in the pull down menu and additional finger sizes can be ordered, please call for details. This item can be custom made in additional carat sizes and stone shapes and colors, via special order. For further assistance, please contact us directly at 1-866-942-6663 or visit us via live chat and speak with a knowledgeable representative.